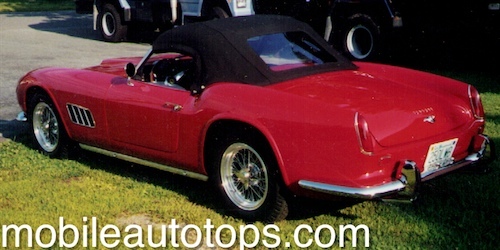 Mobile Auto Tops is the mobile service of Adolph's Auto Top Inc. Based out of Natick Massachusetts from 1960 till 2010, we are now providing auto-upholstery services on a mobile-only basis. This means that we offer a service that comes to you! With less overhead, service costs remain competitive while convenience is high. As long as the weather is fair or you have a reasonable workspace - we come to you! Traditionally, most Auto Upholstery required dropping off your car off at a service shop. We aim to solve the hassle and inconveniences associated with that model by bringing the shop to you. Operating out of Natick, Massachusetts, we serve most of the greater Boston area. All jobs must be booked by appointment. Typically we will come to your location and perform all services on site. Many jobs will require work over multiple days, during all of which the vehicle remains at your work-site. Work timeframe and other details will be communicated up front. In order to book an appointment, or get information regarding your vehicle please do not hesitate to contact us. You can do so by sending an e-mail or giving us a call at 1-508-655-3177. 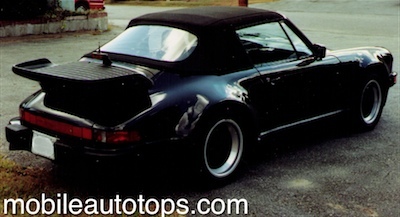 OEM tops or aftermarket tops can be installed, depending on cost concerns. It is important to note that labor time can vary. OEM tops tend to be less problematic and can actually take less time to install. With a reputable manufacturer, fit and functionality will be virtually identical to OEM tops. However, aftermarket tops will be missing the factory logo stamps on the rear windows. Be wary of online tops that seem incredibly low priced. Inferior replacement tops and "B" stock merchandise may not be worth the perceived savings. Seats can be reupholstered as original, or customized ( contrasting piping, inserts or stitching). Additional padding can be used to rebuild a seat cushion, gain height and remedy "sitting in a hole". Additionally, seat heaters may be added to most vehicles. We only use the highest quality seat heater elements from Check Corp. Sagging headliners can often be retrofit with a conversion to an early style headlining that uses multiple bows. The early style headliners took a lot longer to install , but will not drop down over time. The modern, one piece designs are less time consuming to install and do not require expertise to avoid wrinkles. They do , however, have a tendency to delaminate on older cars due to the foam backing breaking down from the heat exposure at the roof of the automobile. It is important to realize that OEM replacement upholstery, carpet, headliners and convertible tops are usually only available for a few years. As an automobile ages, restoration parts availability becomes increasingly difficult. Factory parts may no longer be available. This is especially true of interior upholstery. Engine, transmission and mechanical parts tend to be manufactured for a much longer time than interior trim parts. Fortunately, there are vendors who have stepped up to fill the void! As a mobile service, some of our offerings are limited. However we are always more than happy to discuss the project you have in mind. Please contact us for more information! Looking for expert auto mechanics? 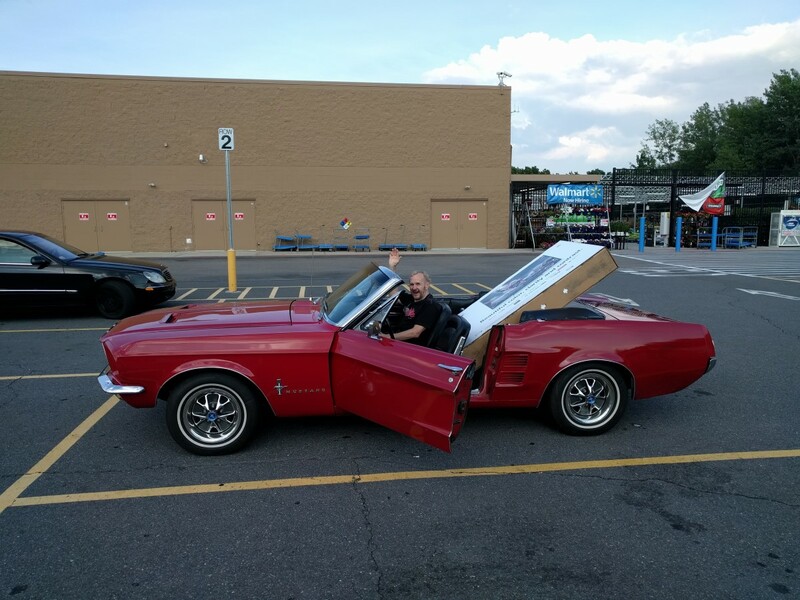 Al enjoying his 1967 Mustang to help move some oversized objects! 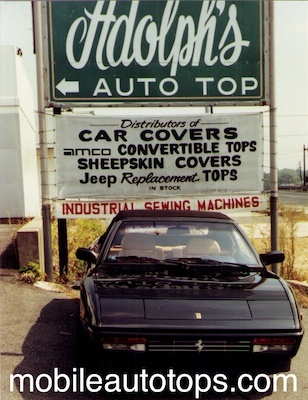 In the past, we have done work for various automotive dealers located on Route 9. Listed are some of those dealers. 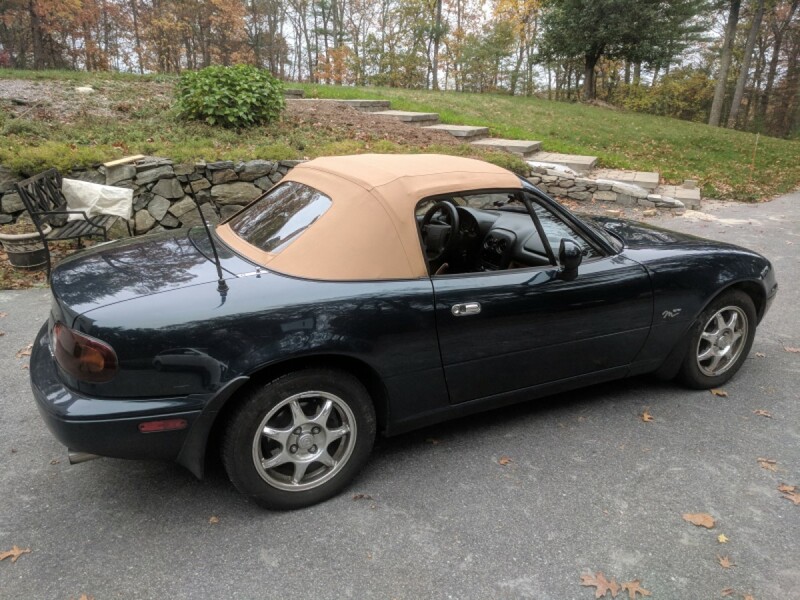 Looking for experts at servicing Mazda Miata / MX-5? 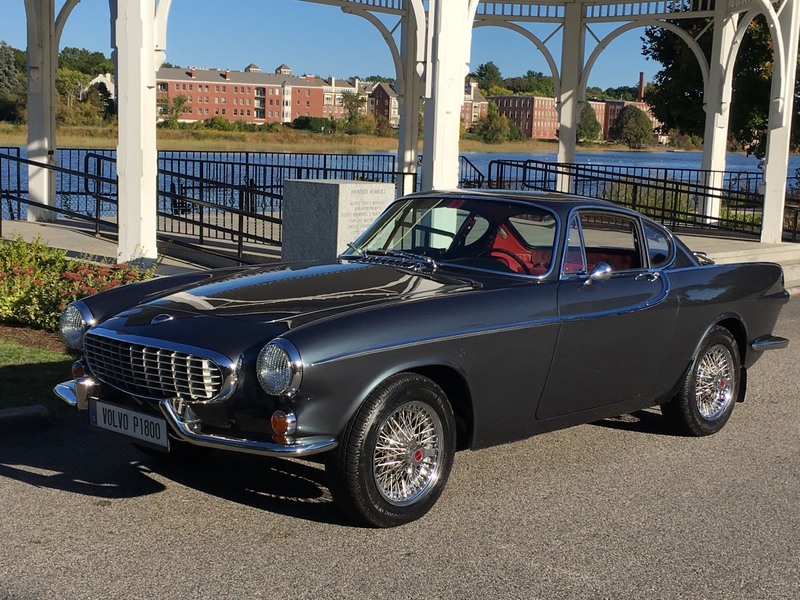 check out our friends at Main Street Auto in Clinton, MA. Questions or comments? Happy to discuss your project. With decades of experience, there are few makes and models we have not worked on the the past. From two-of-a-kind aluminium bodied Ferrari's, to Mazda Miatas we provide top quality upholstery services. By Phone: The best time to call is normally from 10am until 2pm or so, Monday through Friday. We aim to respond to all e-mail requests within 2-3 business days. Often the response time is same-day. © Adolph's Auto Top, Inc. 2018 All rights reserved.